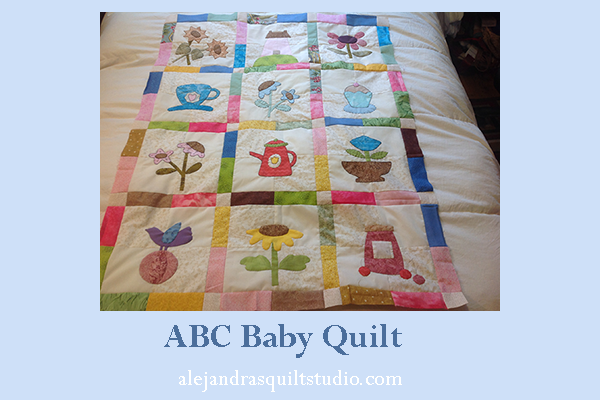 Are you looking for a baby quilt pattern to make, ABC Baby Quilt might be that cute new quilt project you want to make! When you want to make a baby quilt for a new baby to come, I’m sure you want to make something cute for the mother to be and the baby, but you also want to make a baby quilt that last in time. Thinking about this, today as I keep working on my new quilt project, it got to the right size to be a baby quilt! It’s easy to work on a quilt with blocks, as you keep working on making more blogs, this quilt will reach the perfect size to be a baby quilt, a twin quilt, a full quilt and of course, I might get to the king size too, and let’s not forget about the lap quilt, perfect to give it as a present to any occasion! Si quieres leer este articulo en espanol y hacer esta linda colchita para bebé, puedes leer mi blog en español en Ale Cose y Cose .com, gracias por tu visita! Sometimes you want to make a baby quilt to welcome a new member in the family, sometimes you want to make a baby quilt to give it as a present in a baby shower, well I think this baby quilt will never be an UFO as it’s easy to make and you will finish it in a few days. Whether you want to quilt it by hand or by machine, I’m sure it will look nice! 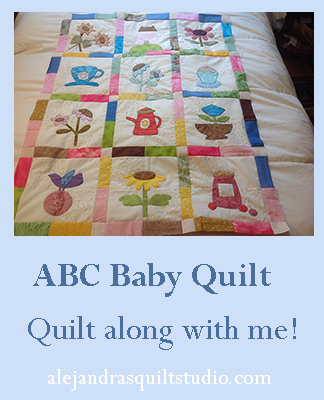 A baby quilt is always a perfect gift for a Baby Shower! You love to sew and you love to quilt, then this baby quilt is perfect for that baby shower you’re invited to attend. At the same time I’m working on my quilt, I make a stop to share with you how it looks now, and today my quilt reached the perfect size for a baby quilt, it didn’t take long to make 12 blocks and sew them together with the borders and this morning it looks like a baby quilt. I won’t quilt it as I will keep working on making more blocks to reach the next size, the lap quilt and after it the twin size, so I can share with you how many blocks you need to make for each one of these quilts. You will need to make 12 blocks to make this cute baby quilt. Four rows of three blocks each one. You can download the PDF to make the blocks and the three first free patterns for the appliques here. If you want to make this baby quilt, I will suggest to you to make the 12 blocks first and iron each one of them, so you can work on the applique. You will need to work on the applique of each block first before you sew the blocks together with the borders, it’s easier to work on the applique on each block first. 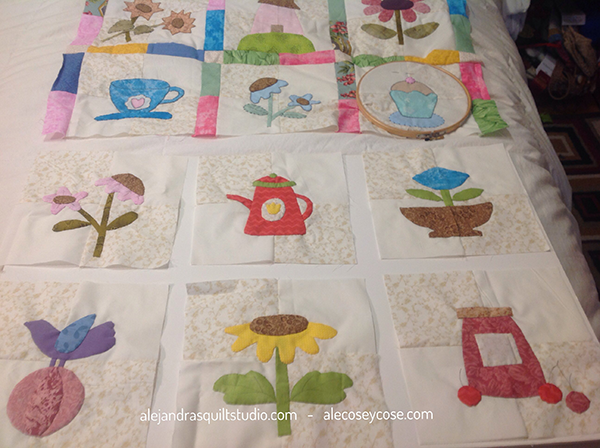 Once you get the 12 blocks with the applique, you can sew them together to make the baby quilt top. You will need to cut 62 pieces of 2 x 5 ” in different color and 20 pieces of 2 x 2 ” in color beige. 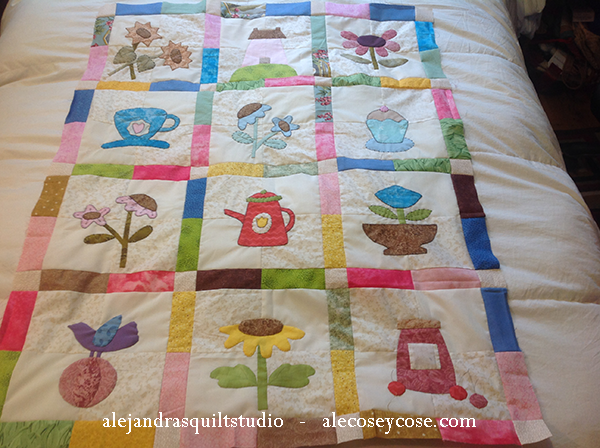 If you have made a quilt before, the baby quilt picture will give you an idea to work to sew together the baby quilt. 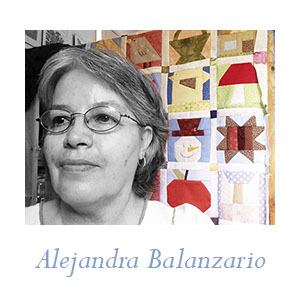 If you’re a beginner quilter, I will get for you a diagram on how you need to work to sew the rows of the quilt first and then sew them together to make the top of the quilt soon, I will let you know when it’s ready so you can follow it, like my Facebook page Alejandra’s Quilt Studio to be the first one to get the updates of my quilts. 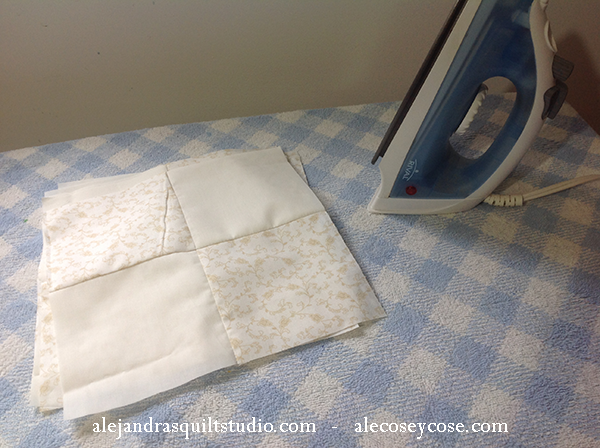 Once you get the baby quilt top done, you can make the sandwich by placing the three layers of fabric to make a quilt, the back fabric facing down, then the quilting fabric or batting and on the top the baby quilt top facing up. Place safety pins to hold the three layers in its place, and the sandwich is ready to be quilted. You can quilt this baby quilt by hand or by machine, I’m sure it will look nice when you finish it. While you work on the quilting and the finish of the baby quilt, I will keep working on more blocks until I reach the size of a lap quilt, so I can share with you more free patterns for the applique and the update on how many blocks and border pieces you will need to make to make this lap quilt. If you have any questions about the baby quilt, you can leave a comment here or at my Facebook page so I can reply to you. Don’t miss the new patterns, you can subscribe to my newsletter now!. If you want to make this baby quilt later, you can pin it so you can find it!